So I went back. A fourth time. And finally, it was open. The focaccia were either raisin, plain, tomato or a few other kinds, ranging in price from $4 to $4.50. Cash freakin’ only. I checked my wallet. Three singles and a bunch of coins that added up to $1.05. For four bucks my choices were plain or onion focaccia. I wasn’t really in the mood for onion but plain was out of the question, so onion it was. I was expecting a piece of focaccia about the size of my palm (fingers included) but when the woman I ordered from disappeared into the back, to the kitchen I presume, she came back with a piece that was about the size of a legal pad. 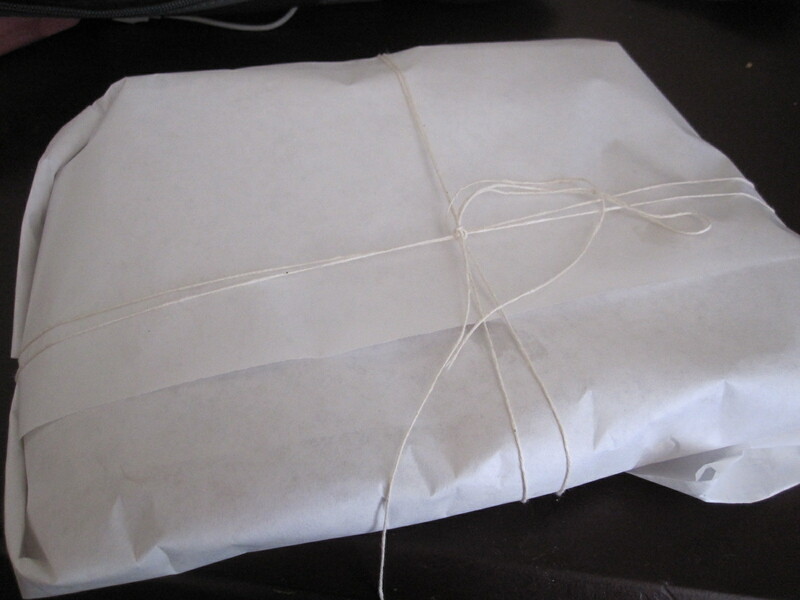 It was glorious, and when she wrapped it in white paper and tied it closed with a string bow, I thought, oh boy, this is gonna be like Christmas. 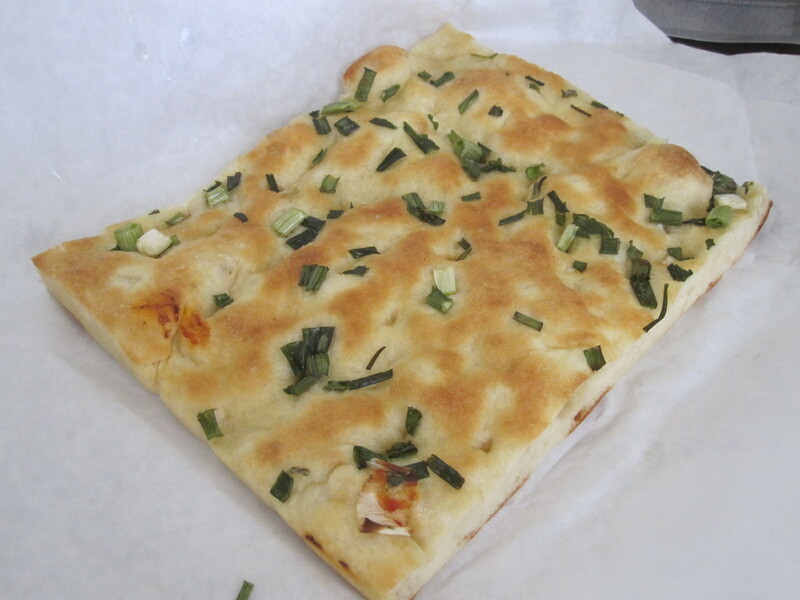 I ran home and slipped off the bow and carefully opened the two sheets that wrapped the huge piece of focaccia. (I’ve always been a cautious gift opener.) It was beautiful. Really, it was. The undulating surface was a warm gold color, with green flecks of chopped scallion peppered on top, the whole thing glistening with olive oil. I tore off a piece and ate it, and then another, and then another, until I had eaten about four times what I had planned on. It reminded me of Florence, of schiacciata, my favorite bread in Italy, a wonderful doughy soft bread that oozes golden green olive oil if you were to squeeze it hard enough. In a city that doesn’t salt its traditional table bread, schiacciata was a Godsend during my time in Florence. A piece of schiacciata the size of a sheet of paper was the perfect lunch, a gift from the carb gods, and here it was again, a little different and flecked with scallion bits, but just as good. Maybe it’s not the third time that’s a charm, but instead the fourth. Either way, I’d say it was worth the wait. This entry was posted in Lunch and tagged California, focaccia, Liguria Bakery, North Beach, onion, San Francisco, scallion, schiacciata, Telegraph Hill. Bookmark the permalink. Ahhhh, Liguria Bakery, as an ex resident of “Spiaggia del Nord”, “Nordabiccia” or North Beach I grew up with the bakery. Forty years ago upon moving across the bay to Berkeley I found myself without access to good focaccia so I had to learn how to make the bread from my immigrant Italian mother, grandmothers and aunts. Though now I am a master bread maker my product tends to lack that special “something” that Liguria Bakery presents; it could be because that not only does one buy a fantastic tasty bread but it’s bought from a store that has changed very little since it was built after the 1906 Earthquake… Also a visit to the bakery is a trip back in time when North Beach was solid Italian, what great memories… What great focaccia, every time I’m in North Beach I buy a “Liguri focaccia” whether I’m hungry or not. My only regret was not trying the other varieties they had. I guess that just means more trips to San Francisco, and specifically la Spiaggia del Nord… which I actually miss!